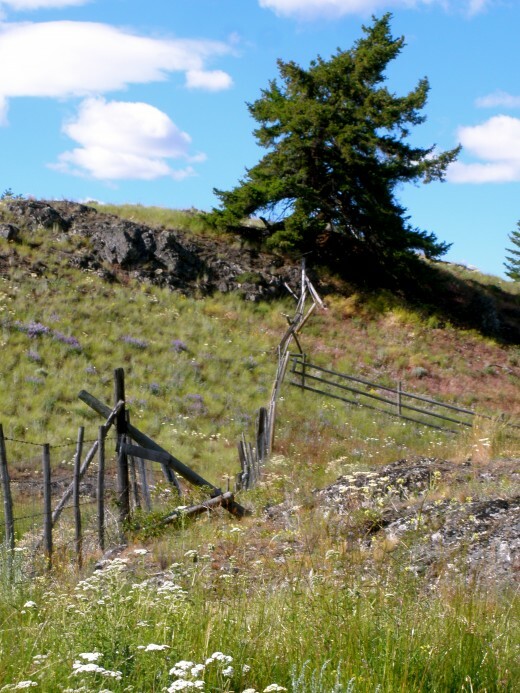 Gateway 2 Ranch is the home of Liz Mitten Ryan, a healer, painter and visionary, who with her husband Kevin, an architect, moved twelve years ago to 320 acres that was once part of the historic Stump Lake Ranch off highway 5A south of Kamloops, British Columbia. 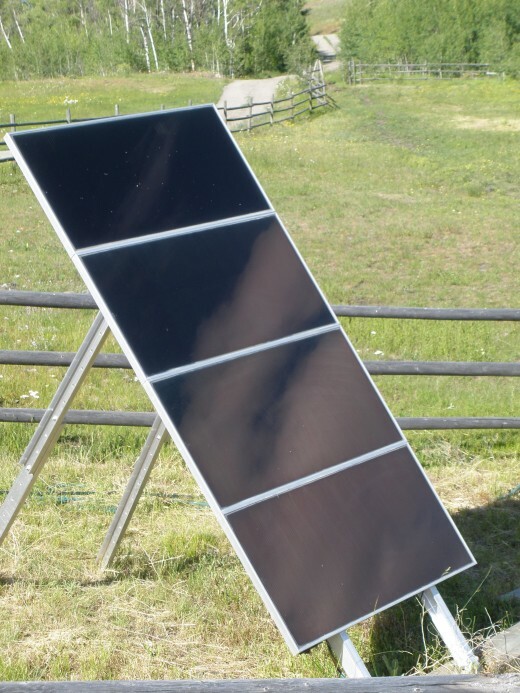 They live off the grid in a house above the barn, their community powered by solar panels scattered around the property and by a windmill whose whirling vanes rise above a rocky hilltop that slopes up behind the paddock. The barn houses the horses, Liz’s herd of nearly twenty, along with several dogs and the steer Tesoro, who thinks he is one of the herd. 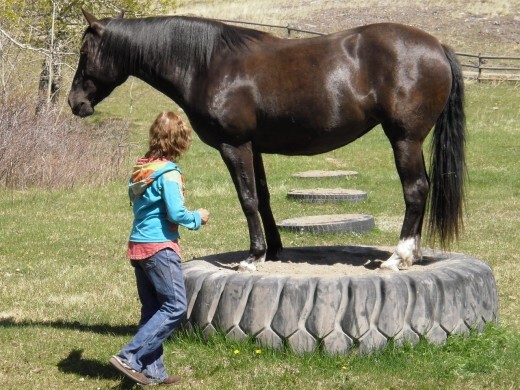 Here Liz has been manifesting her dream to live close to nature and share her love of horses with people she welcomes from all over the world, who come to heal with the wisdom of the horses. 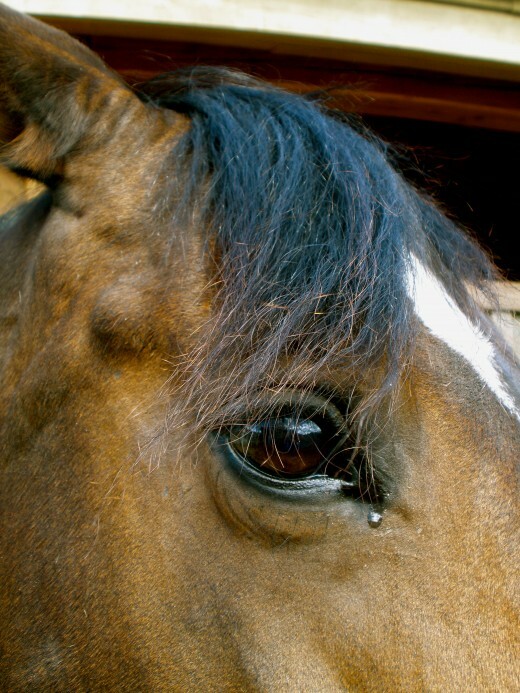 The horses, as all animals,connect to higher consciousness and are able to tune and heal through toning and raising the vibration of people to resonate at the level of wholeness, wellness and oneness where interconnection with all life resides. From this connection Liz has channeled four award winning books, the first of which is One with the Herd. 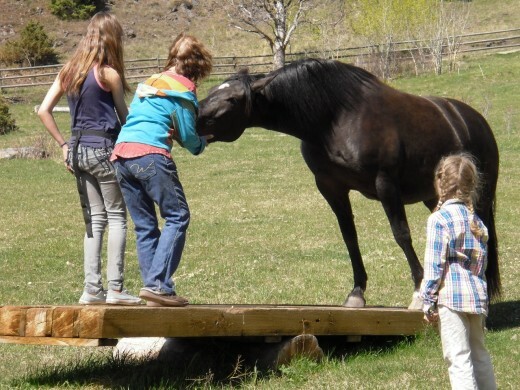 On this unique property, Gateway 2 Ranch, Liz Mitten Ryan collaborates with her horses and with invited guest healers and experts in alternative healing modalities to channel universal life energy for physical and emotional healing of workshop participants, visitors and the earth. 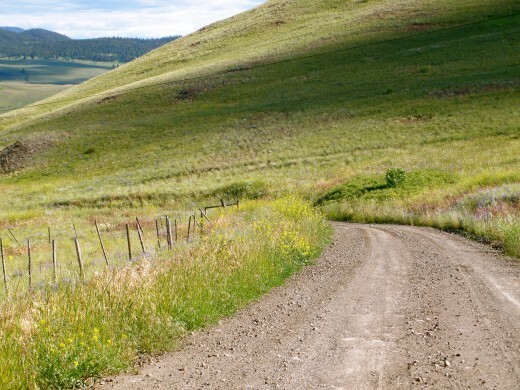 Gateway 2 Ranch is 35 km south of Kamloops, off Highway 5A. 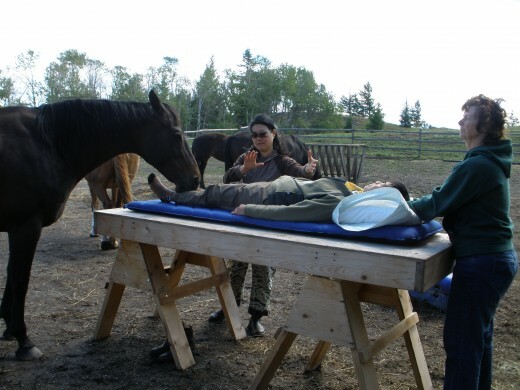 Healers from various schools bring alternative therapies and offer workshops at the ranch--Body Talk, herbalists, first nations shamans, Reiki practitioners, crystal healers, musicians, drummers and others. At these Equinisity Retreats, participants stay in the spirit lodge or in walled tents in the camping area, and shower in the bathhouse. 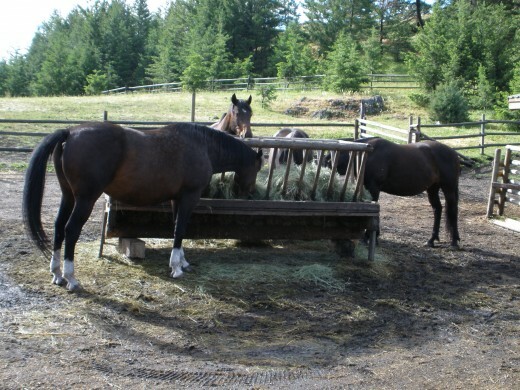 In the mornings, we meet at 9:30 in the barn paddock where the horses munch hay. 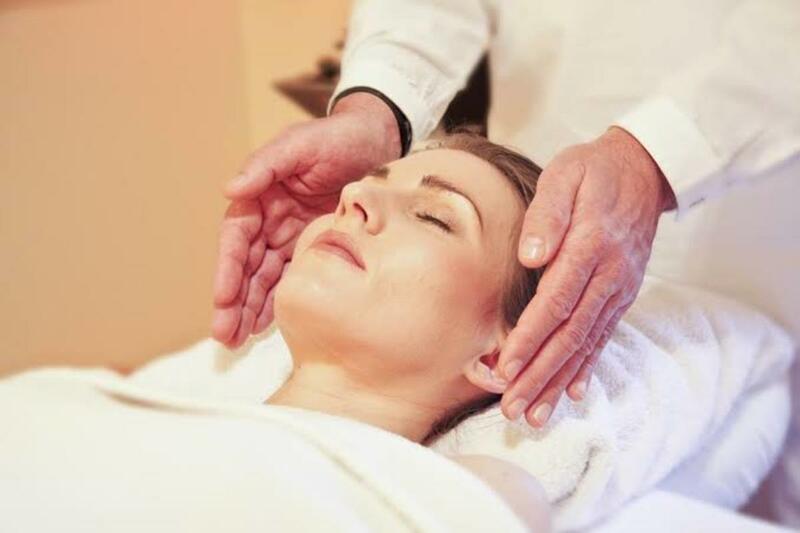 What Alternative Therapies Do Healers Offer? Liz shows us how she plays with the horses at liberty, using focus and intent, the language the horses use with each other. Epona and Merlin excel. Responding to Liz's cues, they touch the cones and the letters placed around the paddock, and move through courses set up like those for agility training with dogs. 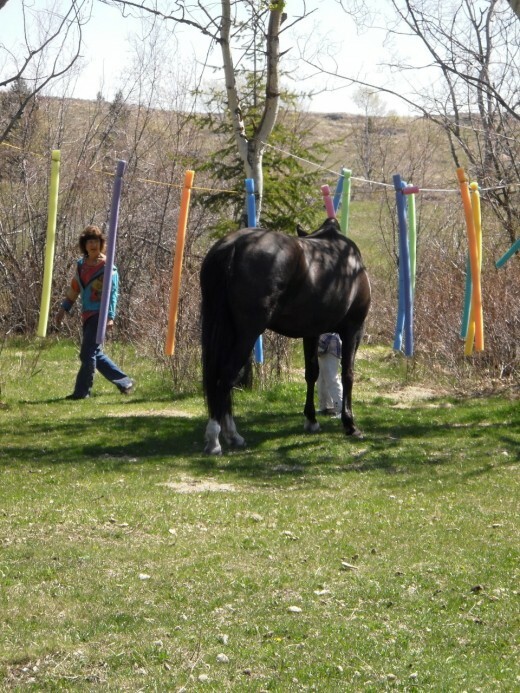 The horses brush unalarmed through colourful strands of hanging pool noodles, step up onto a low platform and climb onto tires of various sizes filled with sand. Some are learning the newly-installed teeter totter, but balk before the tipping point. With more practice, some of the horses will master this skill, too. Liz shows us how to signal them to move backward by brushing their energy field by their chest in a gesture that resembles the opening move Raising the Chi from a Tai Chi sequence. 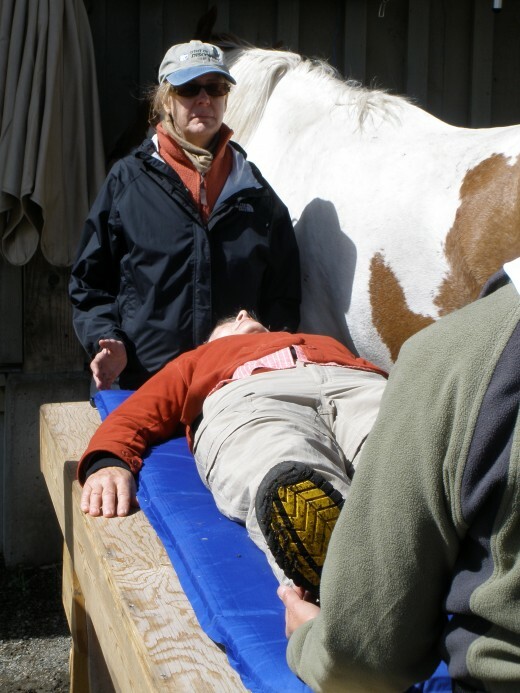 Using intention and mental focus, Liz fixes her gazing point on the horse’s flank to move the horse's back end away and bring its head around, positioning her equine friend to follow her. 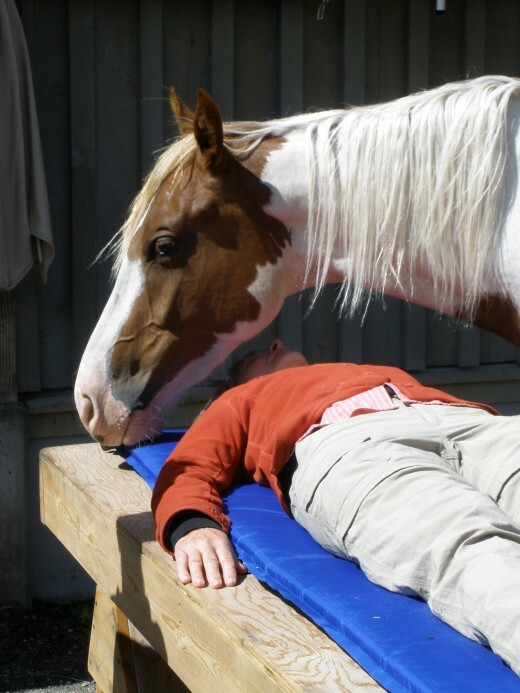 How do the Horses Help the Reiki Healing? 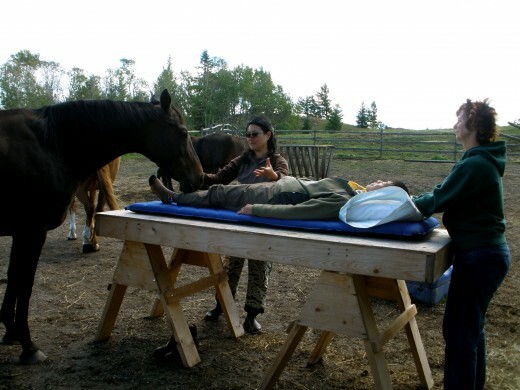 Three energy healing tables are set up on trestles beside the barn. "Who wants to try the energy healing tables and receive a Reiki treatment?" Liz asks. I lie down. Wendy Grono from Kamloops, a Reiki practitioner, comes to run energy for me. I relax and open my channels, offering an attitude of gratitude for the energy healing that I picture has already taken place. Wendy stands at my feet, takes off my shoes, and begins her centering. Gradually the horses come around. Two are near the table. One stands on my left side, her throat above my heart. I watch her. 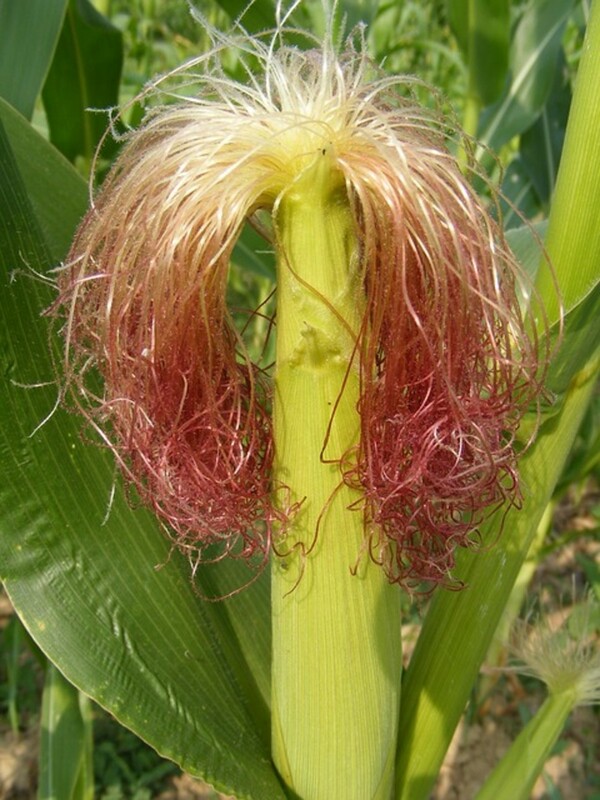 The bristly white hairs on her chin and leathery lips stand out. She bares her teeth as she nuzzles my heart chakra and I see the brown plaque around her gums. She nuzzles my left palm, opening it. “Your receiving hand,” Wendy comments. 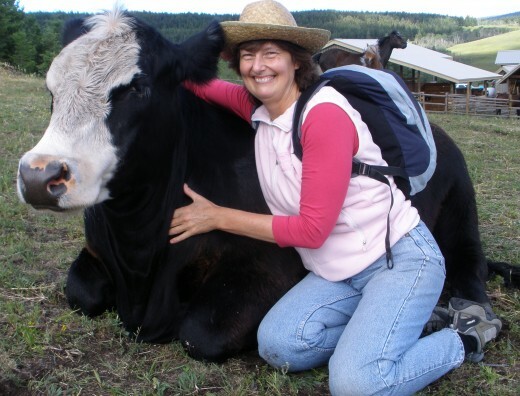 Moving up to my head, the horse takes off my Starbucks ball cap and ruffles her muzzle in my hair, gently tugging the scrunchie out of my ponytail and loosening my hair and the energy around my crown chakra, moving it through me in a rush that Wendy later reports she felt in my feet. So gentle, so loving. I close my eyes, unafraid. As I move into meditation, Wendy and the horses do too. Suddenly I startle. One of the horses, Picasso, nipped the base of my right big toe, gently but firmly and deliberately biting the joint of tarsal and metatarsal, clearing energy. It did not hurt, but charged me, like the energetic charge of a Zen master whose bamboo cane strikes the shoulder of a novice meditator losing alertness, mind wandering, body slackening, head nodding drowsily. WHAP! Meanwhile, in the paddock up the hill, several horses line up in attunement, facing us, their bodies parallel and still, their eyes in the soft focus of meditation. They are amplifying the energy healing, for even at a distance the Reiki joins us all. As Wendy moves up through the Reiki positions, holding my ankle and hip, then my hip and heart, heart and throat, the horses continue. Paschar moves from the hilltop and comes nearer. I move deep into a healing trance and lose awareness of the outer environment. I lose all sense of time. Later, I feel Paschar come to my left foot and nuzzle with her lips, removing my sock. I lie on the table in deep relaxation, returning to waking consciousness. “She is grounding me,” I murmur. 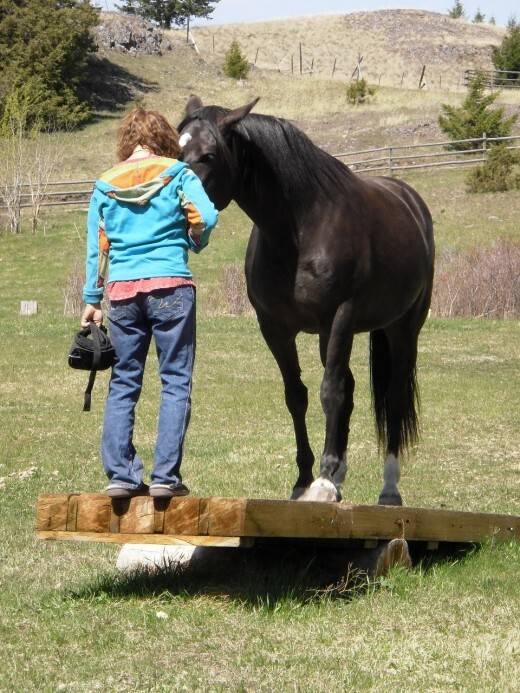 Wendy takes the cue from the horse, “Of course, I need to ground you.” She returns to my feet, holding the right foot and ankle, then the left. Horse and humans in stillness return the Reiki universal life energy to the earth, healing the planet as we heal ourselves. 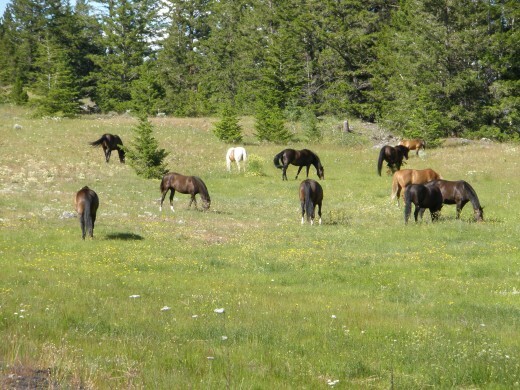 This is the mission of Gateway 2 Ranch, following the leadership of the horses to heal. At lunch we mingle and relax, eating lightly, drinking water. I am very hungry, and the food tastes wonderful. All my senses are sharp. Other participants have had healings, too. We talk softly. Liz takes us upstairs to see her new paintings, horses and angelic beings with arresting eyes, radiating loving kindness. The eyes appear to follow us wherever we move in the room. 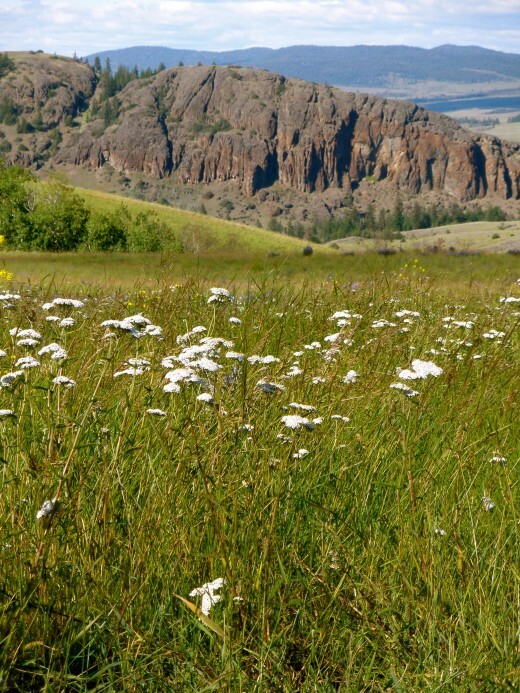 Stump Lake Cattle company has been working the 88,000 acres of its cattle ranch since the 1800's. 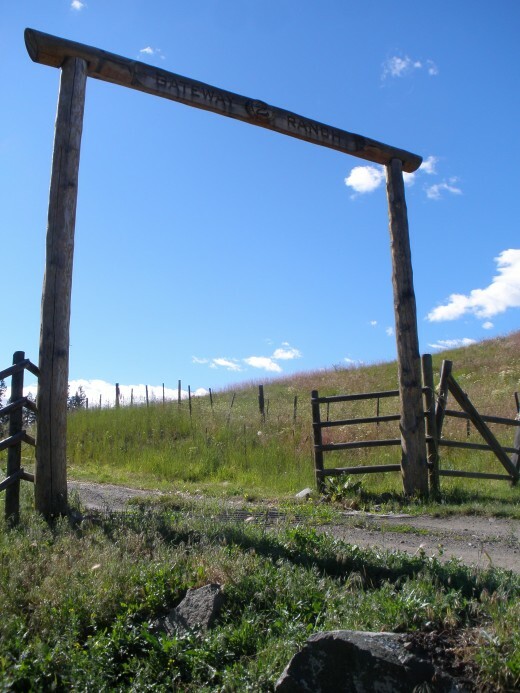 A historic part of British Columbia's interior, it now runs as a working guest ranch, where family vacationers can participate in the daily work of the spread: riding the range, joining round up, watching branding. When guests are ready for the vacation part, they can relax in the hot tub, play volleyball, or take a trip to nearby destinations such as mountain biking, hiking, golf and skiing are in Sun Peaks, and wine tasting in the Okanagan valley. 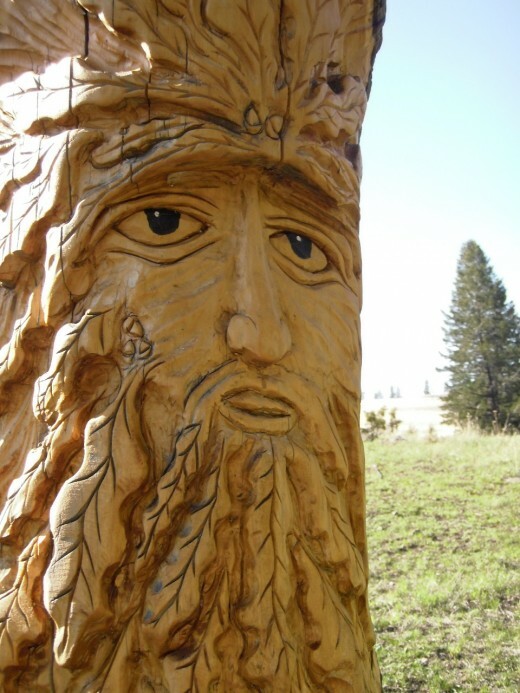 Learn more at the Stump Lake website. How Does the Land Help with Healing Crystals? We spend the afternoon walking the land, which is as powerful a participant as the horses in the energy healing that takes place here. It is located at the beginning of the Nicola Valley watershed. As we drove here from Kamloops in the early morning, we left the wide desert grassland of the desert Sun Rivers area at the confluence of the North and South Thompson Rivers, drove up onto the escarpment near Knutsford, then suddenly dropped into fir and pine watershed lined with finger lakes--Shumway Lake, Stump Lake and more-- along the Campbell River course that flows into Nicola Lake. Gateway 2 Ranch is situated on high land, above the red outcrop of a huge stone cliff, jutting like Ayers Rock out of the grassland. This is rich grazing land, the basis of the the Stump Lake cattle empire. Black bulls beside the roadway that morning had been grazing peacefully as we passed. I noticed their testicles the size of footballs and wondered if I should be wishing there was a fence between my small black Honda Civic and the 2000-pound animals. I kept driving on the rough, stoney road. At lunch time I had picked up my amethyst crystal from my bag in the car, and now hold it in my right hand as we walk. There are rocky outcrops everywhere on the land, like chakras, or wheels of energy that permeate and extend beyond the physical form of living beings. I test them with my pendulum, watch the amethyst stir from stillness into definite circular clockwise motion. Liz points out many places where the trees are growing double or triple stems from one root, or where fallen trees have sent multiple branches straight up from many places along the trunk, channeling their life energy into several new vertical spars. In one place a group of trees grow twisted around a rocky outcrop. “That’s a vortex,” Liz tells us. “Ley lines that grid the planet cross in places and create powerful vortices of energy. Everything that grows there is affected by the vortex of energy, pulled into the current as they grow, and fixing the twist in their trunk.” I learn that below the surface there are also many crystals, veins of quartz and fluorite. At day's end, we enter the spirit lodge to make a circle. We pass the Talking Stick, and those who wish speak of gratitude for the healing they have felt, for Liz’s grace in opening her work to the public so we could share. There are tears, and emotional discharge. In voices and in silence we hold space, we receive, we feel well. While we bid farewell, we know we will fare well, for as our paths part, we provide for the welfare of the other beings in human and other forms that we meet on journeys home. Total Health, thanks for reading and commenting. It's a good way to grow up--close to land, with space and freedom, and lots of contact with animals. Do you still live close to nature? Janis, I really enjoyed reading your hub. Interacting with animals is certainly a fun and rewarding experience. I spent the better part of my youth on a ranch with horses, cows, goats, donkeys, and everything other kind of animal or creature you can imagine and loved every minute of it. Thanks for sharing! Thumbs up. Thank you so much for your comments. There is always more to what we see than meets the eye. First of all I like your writing. Second, I like the way you look at things and the places around us. What an inspirational piece. Thank you. Thank you for stopping by to read and comment, Kbdare. I think more awareness is developing in mainstream therapies of the benefit animals bring to us. The more people have powerful experiences with energy healing and alternative healing modalities, the more the ideas spread. We know the truth of our own experience. Hello Drumweaver!! I am glad you found this. I thought you would appreciate it. This is very interesting. Animals sure can affect people many different ways. I wish more traditional therapists were motivated to utilize animal assisted therapy. Great article thanks for sharing!